Owing to the number of tributes we are adding this page. Also there was a fine tribute to Chris in this weeks Surrey Herald. I just wanted to say a few words about Chris, whom I first saw playing snooker aged 12 at the Woking Conservative club. Having never seen snooker played before, I feel in love with the game there and then, all those reds and colours and the smell of the snooker room (stale beer and fags) really captivated me! In fact, and this is no lie, I played my first ever game of snooker on a full sized table with Chris! This said all you need to know about Chris, the fact that he took the time to play a game with a young lad who had never held a cue in his life before and gave me a few tips along the way. Later when I was somewhat older, I played a lot with Chris, well let’s say I spent many a night picking balls out of the pocket, but it was a pleasure watching him, his cue action, his cue ball control, his break building abilities and he was also a really decent bloke too. Of my many great memories of Chris, one in particular comes to mind; We played 5 frames one evening and Chris made 3 centuries! For those of you who never saw Chris play in his prime, he was a special talent, but sadly his pro career didn’t live up to his potential, primarily because he didn’t turn pro till he was 46, so was past his prime, which in my view was a tragic shame. Finally, I had the pleasure of watching Chris beat Patsy Fagin in the Southern Area final and Roy Andrewartha in the UK final. I also watched him beat Alex Higgins in a tournament somewhere down on the South Coast, which gave all of us who travelled with Chris to watch the game a great deal of pleasure, cause Higgins was doing his pieces, it was special! RIP Chris and thanks for all the memories! NO MARKS FOR USING BLUE CHALK!!! THE VOICE IS SPEECHLESS FOLLOWING HANDICAP VICTORY! OVER THE MOON MEARS HAS SUPERB WEEK!! ANOTHER TWO CENTURIES LAST WEEK - INCREDIBLE. TWO CENTURIES LAST NIGHT - WOW. RYAN TAKES HANDICAP IN HIS STRIDE HITTING 90 & 73 IN THE FINAL. BILLIARDS COMPETITIONS FIRST ROUNDS ON WEBSITE NOW!!! Rule 14(c) TEAMS TIED ON POINTS AT SEASON END!!! 'JACKPOT' HEDLEY REGAINS CHAMPIONSHIP TITLE. RYAN BREAKS DIVISION THREE RECORD WITH MEAR 93. 6 REDS TOURNAMENT - THANK YOU - A GREAT DAY!! WITHDRAWAL PROMPTS IMPORTANT PROMOTION & RELEGATION NEWS. MOBILE PHONES!!!! TOPIC RAISED AGAIN. BILLIARDS HANDICAP- TOM HOWICK IS THE PICK!!! THE 'FRAMP' IS SNOOKER CHAMP. OVER 50'S RESULT. JONES WINS SEASONS FIRST FINAL. COMPETITION RESULTS - WHO TO NOTIFY. CHRIS ROSS 12/03/1933 - 04/05/2013 R.I.P. SIMON FARAHMAND MEMORIAL 6 REDS - LEWIS FRAMPTON IS CHAMPION. BYFLEET START INTER LEAGUE CAMPAIGN WITH EMPHATIC WIN!!! STEVE WILLIAMS NETS 105 RECORD BREAK IN DIVISION TWO!!! ROBBIE HUNT 17/11/1925 - 15/06/2012 AGED 86. LEONARD WINS HANDICAP BUT BILLIARDS IS THE WINNER!!!! 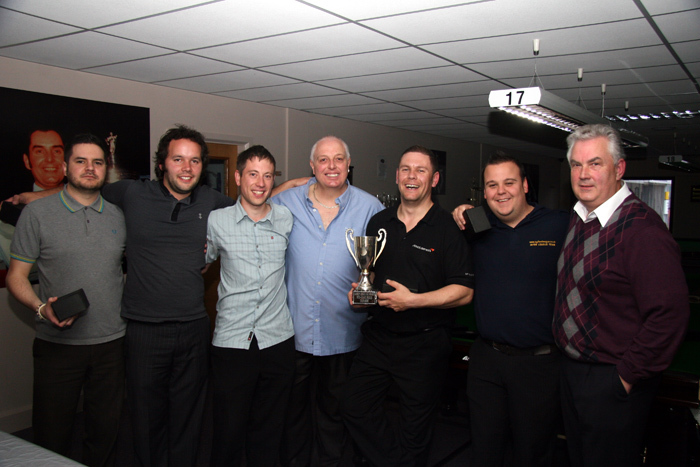 SNOOKER CHAMPIONSHIP - CHRIS BARNARD WINS PULSATING FINAL. RYAN MEARS WINS EXCITING SNOOKER HANDICAP FINAL!!! BILLIARDS - THE HANDICAP SYSTEM EXPLAINED!!! THE DRAW, MEMBERSHIPS, MISS RULE, PRESENTATION EVENING. MATT FLOORS OPPOSITION TO WIN BILLIARDS CHAMPIONSHIP!!! ANDY BAREFIELD & JOE CHURCHILL ARE PAIRS CHAMPIONS!!! FRAMPTON OVERCOMES HANDICAP TO TAKE THE HONOURS. LEAGUE MEETING FEEDBACK - PLEASE READ!!! CHAMPION SURVIVES SCARES BUT REACHES NUMBER 10!!!! BUOYANT BYFLEET ARE INTER LEAGUE CHAMPIONS!!! PEERLESS LEONARD TAKES SNOOKER HANDICAP!!! NEED COACHING? KICKSTART YOUR SEASON. ROD GOUGH RETAINS DIVISION THREE TITLE.